Available at Sushi King Jaya One, Sushi King Kulim Landmark Central and Sushi King Warisan Square only. 50% off on every 2nd item (starting from the lowest value). Applicable for Sushi King members and non- members. Promotion is available on every Tuesday (Noodle items) and Friday (Set Meal items). Not valid with other promotions, vouchers, Sushi King Card discounts and other discounts. All purchases must be in single receipt. Pictures shown are for display purpose only. 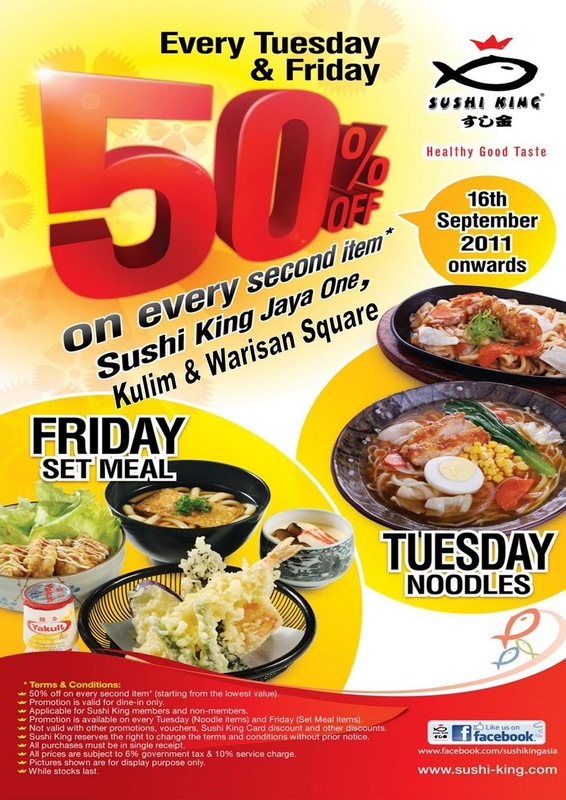 Valid from 16th Sept - 28th Oct 2011.